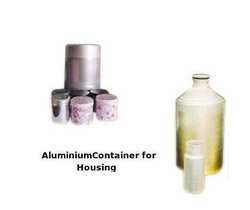 Manufacturer of a wide range of products which include aluminum containers for housing. Aluminum Containers for Housing offered feature high strength finish with seamless/no joints as well as non-corrosive construction support. Bearing long shelf life, these containers are leak proof as well as come with hygienic (with food grade lacquering) and pilfer proof finish. We can make them available in varied exterior finish choices like Matt, Brushed, Bright, Anodized with custom designs bearing logo/design impression of client products. Further, we also offer these with colored lids corrosion resistant and appealing surface finish that provides longer shelf-life for different housing products. Looking for Aluminium Containers for Housing ?